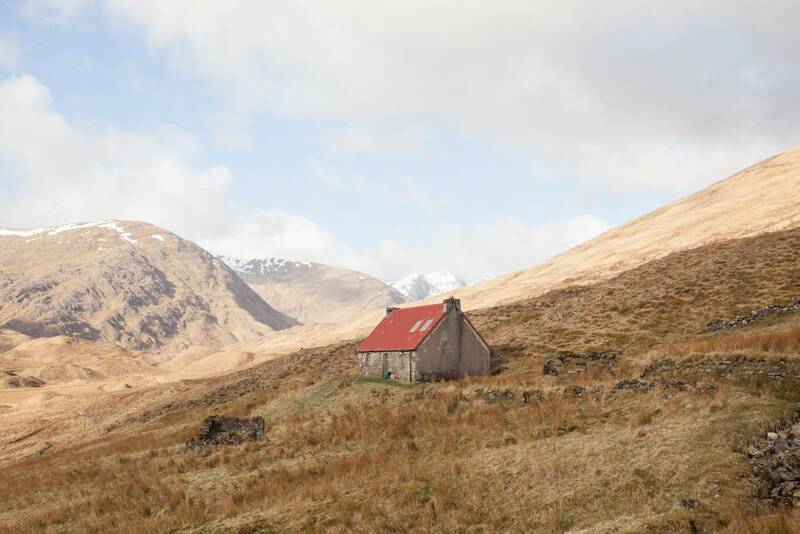 The bothy is a remarkable part of Scotland’s outdoor culture – a basic accommodation left unlocked, for anyone to shelter in. 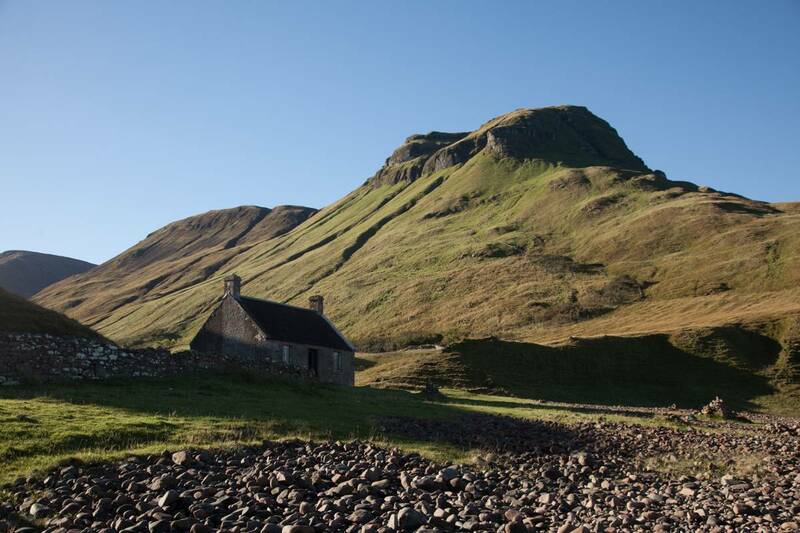 Maintained by the volunteers of the Mountain Both Association and generous landowners, no full Scottish outdoor experience would be complete without a night spent under their roof. Bring a sleeping bag, a wee dram and some fuel for your fire. Enjoy an incredibly wild and remote circuit through lonely glens and over lofty mountain passes. The Camban walk is too long to enjoy in one day but perfect when you break the journey with a night-stop at Camban bothy. Boasting two relatively large rooms and fireplace the bothy is located ten miles from anywhere and certainly provides a feeling of isolation. Although there are extremely well-made paths almost all the way, there are some indistinct sections heading up Gleinn Gniomhaidh, so this is one for the adventurous and properly equipped – help is a long way off. Start at the NTS (National Trust for Scotland) car park in Morvich (IV408HQ). Follow signs for Glen Affric via Gleann Licht, taking the wide track along the River Croe up Gleann Licht (or Lichd), passing a red-roofed mountaineering hut. Ignore a path off R and cross two well-made footbridges. Follow the excellent path over the Alt Grannda gorge past the waterfall and down the other side of the pass to Camban Bothy. Follow the path to a confluence of rivers (57.2285, -5.1940). Cross the first footbridge (the second leads to Glen Affric hostel), and follow the path L into Gleann Ghnìomaidh. The path can be indistinct and boggy here, but the way up the glen is obvious, passing a plunge pool on the Allt Gleann Ghnìomaidh. Eventually the path reaches Loch a’ Bhealaich, before continuing up and over Bealach an Sgàirne between Meall a’ Bhealaich and A’ Ghlas Bheinn. Gleann Chòinneachain has well-ordered forest cultivation and leads back to Morvich. On the edge of miles of bleak moorland used for military target practice, and just west of the mainland’s highest cliffs, a single track leads down to one of the country’s loneliest places. Kearvaig Bay is surrounded by dark rocks, including 40m tall Stack Clò Kearvaig, known as ‘the cathedral’ due to its pair of spire-like sandstone pinnacles and natural window created by the sea. 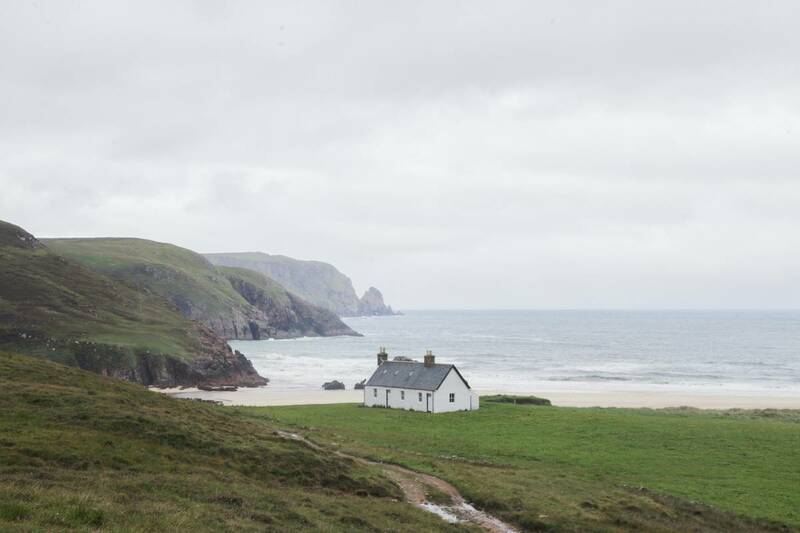 Standing alone in the bay is one of Scotland’s most beautiful bothies, a white washed croft looking out to sea. Wood is scarce, so carry some with you and you’ll find that a roaring fire makes for one of the best bothy experiences on offer. From Cape Wrath lighthouse follow the only road on foot, heading E through the moorland. Shortly after crossing a bridge over the river, turn L onto the track and continue for just over 1 mile until it descends to the bay. 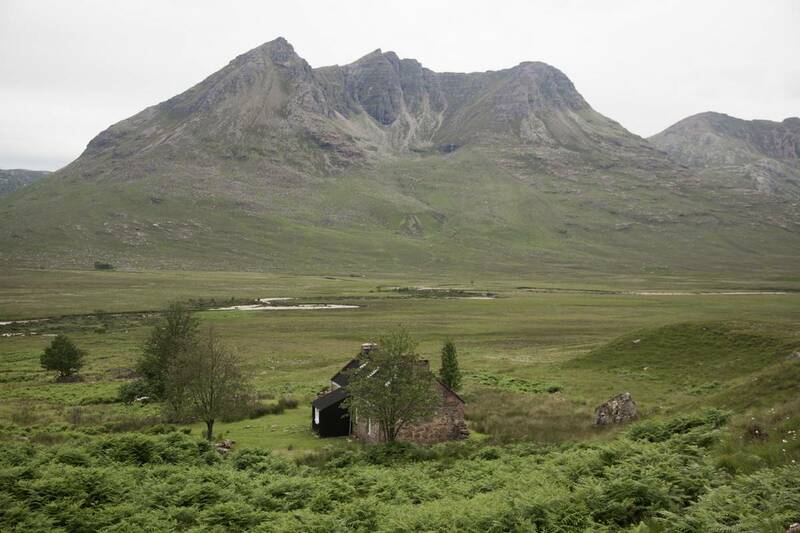 One of the more famous bothies in the Highlands, Shenavall has unrivalled views over the remote wilderness of the Fisherfield Forest estate. Unfortunately, you are unlikely to get this place to yourself so carry in a tent and be prepared to sleep outside if it is full. From the long layby at Corrie Hallie on A832 (just S of IV23 2QN). Take track opp, signed for Gruinard, Poolewe and Kinlochewe. Follow good track for several miles to a R fork for Shenavall. Follow this with An Teallach on your R. After 5 miles/2hrs, you will reach the bothy. 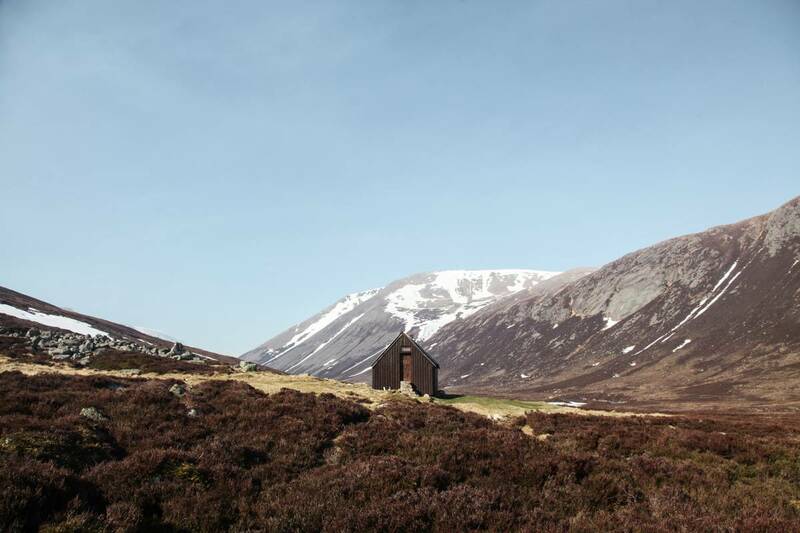 Deep in the Cairngorms, Corrour Bothy stands as a cosy outpost of shelter at the wildest heart of the Highlands. Much photographed and frequented, it lies directly below the shapely peak of the Devil’s Point. This small, one roomed stone shelter, which is engulfed by the vastness of the surrounding landscape, almost goes unnoticed as it appears a minute spec deep in the Cairngorm mountains. Start by Rothiemurchus Camp and Caravan Park (500m E of PH22 1QN, layby parking). Head down the path next to the caravan park and follow all signs for Lairig Ghru through the Rothiemurchus Forest. There are clear paths, and the way should be obvious, eventually bearing E down Glen Laoigh Bheag to Derry Lodge and the Linn of Dee. Walking S from Pools of Dee you reach Clach nan Taillear (Stone of the Tailors). Cross the Dee shortly beyond this at an obvious path to the bothy, below Devil’s Point. You will need to arrange transport if you wish to return to the start, as there are no practical public transport options. This enchanting bothy is set amongst the ruins of a pre-clearance settlement in Guirdil Bay on the wild coast of the Isle of Rùm. The Guirdil River rushes down the glen and into the sea below Bloodstone Hill, a rocky peak towering over the bay. The ominous name derives from the semi-precious jade green mineral with flecks of red ‘blood’ running through it which is found on its slopes and amongst pebbles on the beach. There are magnificent views of Canna from the bay where feral goats and deer often roam. Inside the bothy a large deer skull hangs above the stone fireplace and in late September, you can hear the rutting stags roaring on the hills outside as you lie inside your sleeping bag. From Kinloch Castle follow track for Kilmory Bay but ½ mile after the R fork, turn L on the Glen Shellesder path as it heads gradually uphill and W between Minishal and Sgaorishal hills, past forestry plantation and old shielings. After approx 2½ miles the burn descends to the coast via a waterfall, and just N of waterfall. Carefully cross to S side of the burn via a ford 75m from the headland. Continue SW along the coast until the bothy is visible below, and carefully descend to the bay via one of the faint paths. This route has many fords: do not attempt during or just after wet weather. Bring a map. 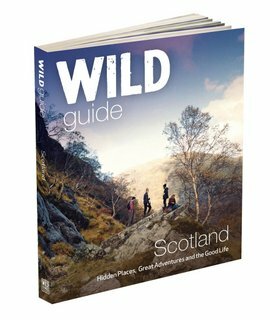 Wild Guide Scotland: Hidden Places, Great Adventures & the Good Life Paperback by Kimberley Grant, Richard Gaston, David Cooper charts 750 of Scotland finest wild places and is published 1st May by Wild Things Publishing (£16.99).